Isabelle de Tomaso's homebred Grade 2 winner Irish War Cry, back on familiar ground at the Fair Hill Training Center in Fair Hill, Md., continued preparations for his next start with a six-furlong breeze over its main track. Recently named the New Jersey-bred champion 2-year-old of 2016, Irish War Cry was timed in 1:13.40, the fastest of three horses at the distance, all trained by Graham Motion. It was the second work for Irish War Cry since suffering his first career loss when seventh as the favorite in the Fountain of Youth (G2) March 4 at Gulfstream Park. He went five furlongs in 1:01.10 March 25 at Palm Meadows, Gulfstream's satellite training facility where he spent the winter. Irish War Cry won his first three starts, including a maiden victory Nov. 11 and the Marylander Stakes Dec. 31, both at Laurel Park, prior to his impressive triumph in the Lambholm South Holy Bull (G2) Feb. 4 at Gulfstream. 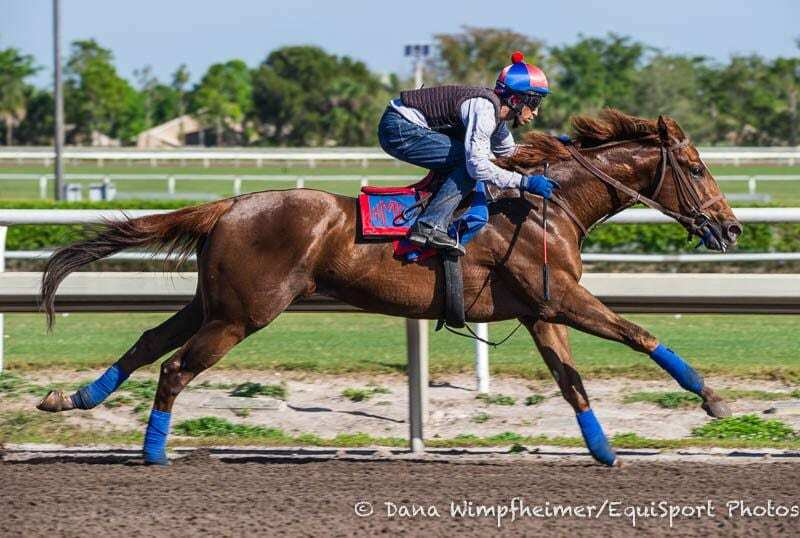 In the Fountain of Youth, Irish War Cry pressed a demanding pace set by Three Rules before tiring to finish 21 ¾ lengths behind late-running winner Gunnevera, who returned to be third behind Always Dreaming in the $1 million Xpressbet.com Florida Derby (G1) Saturday. Irish War Cry is set to make his next start in the Wood Memorial (G2) April 8 at Aqueduct. Motion was happy with the performance of Happy Mesa, winner of the 2016 Selima last fall at Laurel who was beaten a neck as the favorite in the $100,000 Sanibel Island for 3-year-old fillies on grass Saturday at Gulfstream. It was the second start of the year for Happy Mesa, coming four weeks after she was fourth by less than two lengths in the Herecomesthebride (G3) at Gulfstream. The $100,000 Hilltop at one mile on the turf at historic Pimlico Race Course May 19 is a possible target, Motion said. This entry was posted in blogs and tagged aqueduct, Curlin, fair hill, Graham Motion, happy mesa, irish war cry, road to the kentucky derby, wood memorial by Press Release. Bookmark the permalink.